G4J Connect:Bristol – The Debrief! G4J Connect: Bristol followed in the footsteps of several successful G4J events held in the north of the country in 2014 and early 2015. Organised by ST4 trainee Amy Crees and core medical trainee Hannah Mottershead, the 2 ½ hour evening session ran on Thursday 26th March at Southmead Hospital. The thirty-five attendees mainly comprised doctors in their foundation years and core medical trainees from across the Severn region. The aim was to offer short, snappy talks on contemporary topics within geriatric medicine, as well as advice and information about pursuing it as career. The evening kicked-off with a presentation on interface geriatrics by North Bristol consultant Jarrod Richards; this was followed by a talk on frailty by ST4 trainee Heather Woodcraft, and one on Parkinson’s disease by Bath consultant Robin Fackrell. As it is hard to separate the discussion about pursuing a career in geriatric medicine without tackling the “med reg issue”, attendees then had the chance to address their questions about being the medical registrar and a geris trainee to a panel of registrars from across the region. ST3 trainee Sarah-Jane Bailey rounded-off the evening with her talk on the process of applying for specialist training. Feedback from the evening was very positive, with attendees particularly citing the quality of cases used for talks, and the advice given on focusing their CVs. Light refreshments were available throughout the evening, and were made possible by generous sponsorship from the British Geriatrics Society. There are many misconceptions about geriatric medicine, and junior doctors are often unaware of just how much the specialty is expanding and diversifying. 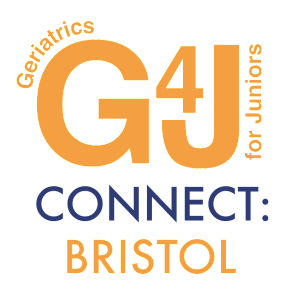 It is hoped that G4J Connect: Bristol has helped to dispel some of these misconceptions, and pique the interest of doctors in a region where there have so far been few similar events. The organisers are keen to run another event later in the year…watch this space!